"A Pembrokeshire proverb. Eat an apple on going to bed, And you'll keep the doctor from earning his bread." "Ait a happle avore gwain to bed, An' you'll make the doctor beg his bread; or as the more popular version runs: An apple a day Keeps the doctor away." 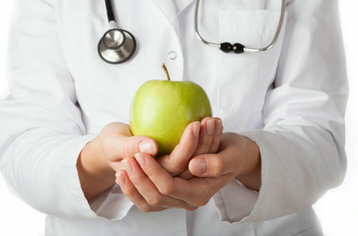 Apples have a good claim to promote health. They contain Vitamin C, which aids the immune system, and phenols, which reduce cholesterol. They also reduce tooth decay by cleaning one's teeth and killing off bacteria. It has also been suggested by Cornell University researchers that the quercetin found in apples protects brain cells against neuro-degenerative disorders like Alzheimer's Disease. 1、This is a saying. You don't use "doctors" because that is not what the phrase is. It is not grammatically or semantically wrong to say doctors. However, it is not the phrase. 2、In this instance you are talking about one apple (which are known to be very nutritious). So in this sentence one doctor would be all you would need because you would be in good health. This term is also a saying, so don't analyze it too much because many sayings in English cannot be translated literally (much like other languages). Prescribing an apple a day to all adults aged 50 and over would prevent or delay around 8,500 vascular deaths such as heart attacks and strokes every year in the UK -- similar to giving statins to everyone over 50 years who is not already taking them -- according to a study in the Christmas edition of The BMJ. The researchers conclude that the 150 year old public health message: "An apple a day keeps the doctor away" is able to match more widespread use of modern medicine, and is likely to have fewer side effects. The research takes into account people who are already appropriately taking statins to reduce their risk of vascular disease and therefore the authors stress that no-one currently taking statins should stop, although by all means eat more apples. In the United Kingdom, lifestyle changes are the recommended first step to prevent heart disease. However, trial data suggest that statins can reduce the risk of vascular events, irrespective of a person's underlying risk of cardiovascular disease. As such, calls are being made for greater use of statins at a population level, particularly for people aged 50 years and over. "This study shows that small dietary changes as well as increased use of statins at a population level may significantly reduce vascular mortality in the UK," say the authors. "This research adds weight to calls for the increased use of drugs for primary prevention of cardiovascular disease, as well as for persevering with policies aimed at improving the nutritional quality of UK diets," they conclude. Dr Adam Briggs of the BHF Health Promotion Research Group at Oxford University said: "The Victorians had it about right when they came up with their brilliantly clear and simple public health advice: "An apple a day keeps the doctor away." It just shows how effective small changes in diet can be, and that both drugs and healthier living can make a real difference in preventing heart disease and stroke. While no-one currently prescribed statins should replace them for apples, we could all benefit from simply eating more fruit."